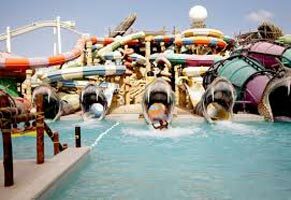 Yas WaterworldAny increase in the air fare charged by the airlines on your air ticket. Today, post breakfast in the comfort of your hotel, we proceed to Abu Dhabi. We visit the world’s largest indoor Ferrari theme park which features a host of rides and attractions to create an unforgettable experience for every member of the family. Today post sumptuous breakfast, we proceed to UAE’s First Mega Waterpark - Yas Waterworld located on Yas Island. Get ready for unforgettable water adventure for the entire family! Overnight at the hotel in Abu Dhabi.